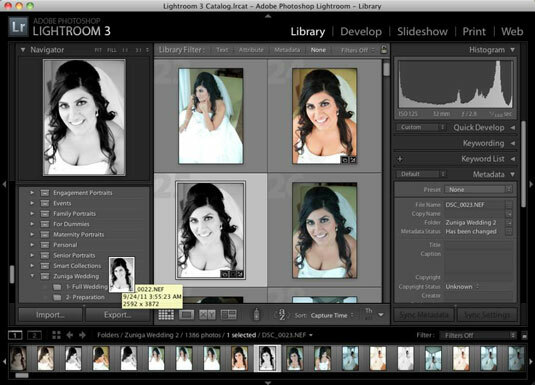 1Open Lightroom and click on the Library module in the upper right-hand corner of your screen. 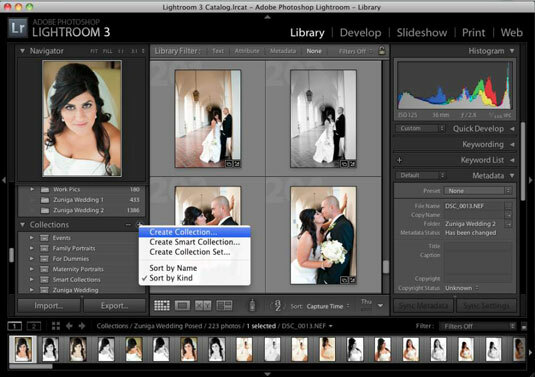 The library setting shows multiple images at once, allowing for easier organization. 2Navigate to the Collections dropdown list on the left-hand side of your screen and click the + button that’s next to the word Collections. A little box opens when you click the + sign. Select Create Collection Set. 3In the new Create Collection Set dialog box that opens, enter the name of your collection set in the Name field. In this example, the collection is named Zuniga Wedding. 4Choose None in the Set tab, and click Create. Your new collection set appears under the Collections panel on the left-hand side of your screen. 5To create a new folder within your collection set, right click your collection set and choose Create Collection. Again, a new box opens up where you can name your new folder. 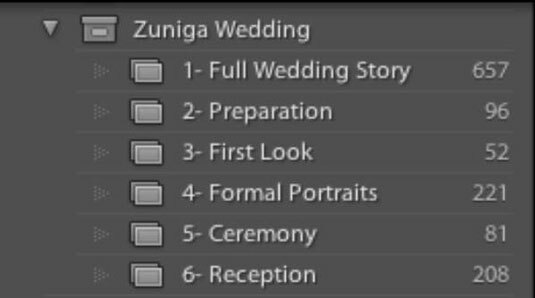 Make sure that your collection set’s name (such as Zuniga Wedding) is selected under the Set tab. Click Create. You can name this first folder something like Full Wedding Story, and it’s where you can move your select images that you want to edit while you cull the shoot. This way you have all your best images in one place that is easy to find. 6To add pictures to your new collection, scroll up above the Collections panel on the left-hand side of your screen to the Folders panel and select the images you want to add. You have the option to move one photo at a time or several at once by selecting the thumbnails in grid view. 7Click on and drag the selected images to your new collection under the Collections panel. 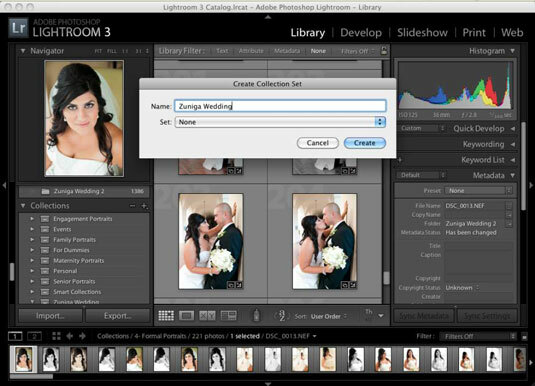 The Create Collection dialog box allows you to place a new collection in a collection set. 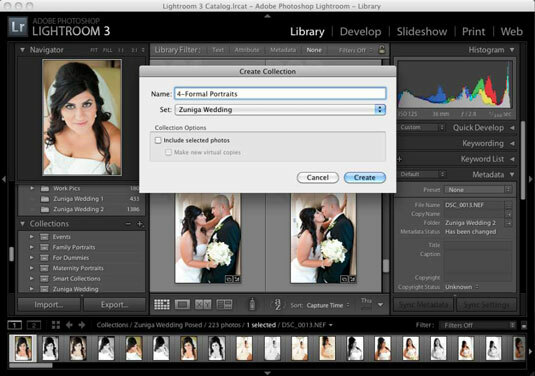 8To create additional folders within your collection set, continue to click Create Collection under your collection set. These additional folders under the main collection set are where you can break down the wedding into different categories that are useful to me: Preparation, First Look, Formal Portraits, Ceremony, and Reception. 9To add photos to these additional collections, head over to your Full Wedding Story collection and select, click, and drag your desired photos into their proper categories. Keep in mind that, unlike in the Folders panel, adding or removing images from a collection doesn’t add, delete, or move any photos from your hard drive. It only adds or removes photos from that category or collection.